In the entire Solar System, only Mars and Earth rotate at similar rates and have rotational axes inclined to the ecliptic at similar angles. These similarities may have been established by a close electromagnetic coupling which brought both planets to a common inclination of their rotational axes, and to a common rotational speed. Mars has only 10.8% of the mass of Earth so Mars would have more closely accommodated its rotational parameters to those of Earth. The distance between Earth and Mars is at a minimum about every 780 days, and their separation at each seventh pass, occurring about every fifteen years, is said to be less than the rest. The frequency of these approaches may reflect a continued adherence to the frequency of catastrophic encounters that took place during the eighth and seventh centuries B.C. and which are described by Emmanuel Velikovsky in his book ‘Worlds in Collision’. Earth had five close encounters with Mars from 747 B.C. to 687 B.C. with the latest ones predicted by prophets around the world. Today, the closest approach of the two planets continues on this same frequency. Mars bears physical evidence of at least two especially close encounters with Earth, and as Velikovsky recounted in detail, a wealth of recorded historical evidence shows that more recent encounters have taken place. Close encounters between Earth and another planet must occur more frequently than the largest asteroid impacts but the record left is less obvious. Mars, like Venus, is known to have a ‘phase lock’ on Earth which means that it presents its same face toward Earth on each closest encounter. In his book ‘Worlds in Collision’, Immanuel Velikovsky got into trouble when he stepped out of the role of historian and into that of a scientist. Carl Sagan wrote, “…where Velikovsky is original he is very likely wrong; where he is right the idea has been pre-empted by earlier workers.” It is not a sin for a historian to be pre-empted as original historians are called ‘novelists’. As for the claim that planets change their orbits from time to time and interact, it is Velikovsky who was right. There is a duality to science: one part is technological and the other is interpretive. The technological part thrills and amazes us and a favorite early example and a tremendous achievement was NASA’s ‘Voyager’ program which acquainted us with the outer planets and their moons. The interpretive side of science can be a different story and the accepted account of the history of Mars for example, and its geomorphology in particular, is wrong. This is because some of the most fundamental lessons about our Solar System in general, and Earth in particular, have been mislearned and wrong conclusions from Earth are now being applied to Mars. Much energy has been expended by astronomers to determine relative ages of Martian surface features by counting craters. Areas with many craters have been concluded to be older by millions of years, than areas having few. It is explained here how most of these craters were formed by a catastrophic process within a few hours. Mars has two moons, both of which follow orbits that are slightly unstable. Phobos, average diameter 22.3 km (14 mi.) orbits within 6,000 km (3,730 mi.) of the Martian surface. This is close to the ‘Roche limit’, which is the distance at which tidal disruption threatens the moon’s physical integrity. The Roche limit is 2.4 times the radius of a planet for a moon having a similar density. The velocity of Phobos is slowly increasing, which means that its orbit is diminishing in size so that it could eventually strike the Martian surface. The smaller moon, Deimos, average diameter 12.7 km (8 mi. ), orbits at about 20,000 km (12,500 mi.) above the surface of Mars. This is close to the geosynchronous-orbit position and is also close to the outer limit at which the planet is able to retain it. Its velocity is decreasing, which means that it could eventually part company with Mars. Both moons constantly present the same face toward their planet. 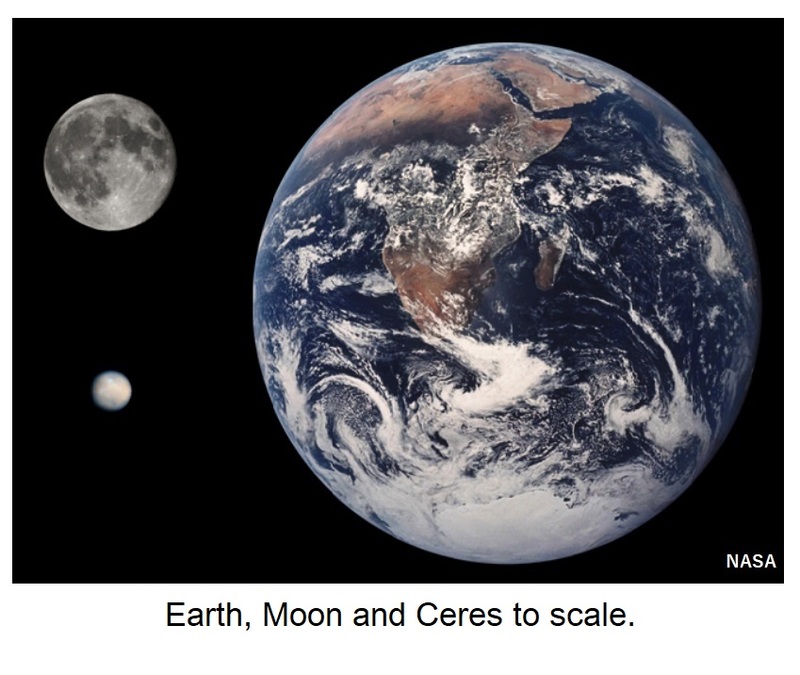 For comparison, Earth’s moon is an average distance of 384,400 km (238,850 mi.) away. Neither moon follows orthodox views of how moons are supposed to look or behave. Their general appearance is similar to that of asteroids populating the Main Asteroid Belt, suggesting large asteroids that impacted Earth were not encountered randomly. They may have been brought to Earth as moons of Mars. Space is vast, and the probability of random collisions between Earth and large asteroids is small. Nonetheless, Earth has a high internal energy level because it has received many major impacts, in even the recent past. It is my guess that the Martian moon Phobos is comparable in size to the asteroid responsible for the impact that formed the Venezuelan Basin. The moons of Mars orbit so close to their planet that neither would be visible to observers at the Martian poles. They were not discovered until 1877; at least, that is what the history books tell us. Jonathan Swift, however, wrote about two Martian moons, and so had Voltaire, and in allegorical terms, so had Virgil and Homer (‘Worlds in Collision’). In the book ‘Mars Beckons’, by John Wilford, an old story is repeated that attributes knowledge of the moons to a prediction by Kepler, in 1610. The way the story goes is that two moons appealed to Kepler’s passion for progression, since Venus has no moon, and Earth has one and Jupiter has four (major) moons. Jonathan Swift, however, got more than just their number correct, while Homer and Virgil preceded Kepler. Swift described their roughly ellipsoidal shapes, as well as their remarkably short periods of revolution, neither of which had any known precedent. As Velikovsky surmised, Swift must have had access to an ancient account which has been lost. During close planetary encounters with Mars in the eighth and seventh centuries B.C., the moons would not have escaped detection. All moons in close orbit having sufficient mass are tidally locked, which means they constantly present the same face to their planet. This is attributed to tidal forces synchronizing the rotation of both bodies. Moons tend to develop hemispheric asymmetry as shown by Earth’s Moon, which has a bulge 1,000 m (3,300 ft.) high. The theory is that the bulge has resulted from the gravitational attraction of Earth acting upon the perpetually presented face. Mars may once have been a moon itself, perhaps of Earth, for its form displays a striking hemispherical asymmetry, with the plane of demarcation inclined at an angle of approximately 300 to the present equator. Every moon in the Solar System is the result of capture, and no moon developed by accretion in its present orbit. 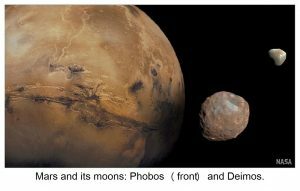 Even those scientists who have recognized that Phobos and Deimos are former asteroids puzzle over how they could have come to Mars, for their dogma precludes any consideration that Mars traveled to them. Proponents of the new science Chaos Theory have introduced unexpected gravitational instabilities in order to explain the catapulting of asteroids from far beyond the orbit of Mars to the vicinity of Earth orbit. They haven’t recognized that Mars may have a specific function within the Solar System, which involves cycling between the Main Asteroid Belt and the vicinity of Earth orbit. Mars brings large, usually stony asteroids close to Earth which impact Earth whenever Mars loses its hold on them. Each time, another leaf is turned in the book of evolution on Earth, as new points come to occupy the geographic poles and oceanic floods ravage the planet. These events have occurred more recently than most can imagine. Parallel markings on Phobos have been described as grooves, although their similarity in appearance to basaltic flows is striking. If they are flows, they had to form on a world under the influence of gravity. That would be the Lost Planet, debris from which constitutes a major part of the Main Asteroid Belt, right where the Titius-Bode rule predicts that a planet should be. Phobos may be a part of that Lost Planet. Critics claim that there is not enough mass in the asteroid belt to form a planet, but this claim is irrelevant. Ceres is a small world which bears no relationship to its asteroid neighbors, but if one combines the mass of all present stony to iron asteroids with the large asteroids that have impacted Earth, and consider that others might have impacted other worlds or even left the inner solar system without ever having resided in the Main Asteroid Belt, there could easily be enough. It has been estimated that there are up to almost half a million asteroids having a diameter exceeding 1 km (0.6 mi.) accompanied by millions of smaller ones. Of the largest, there is estimated to be more than 200 having a diameter exceeding 100 km (60 miles) with another 200 exceeding 6 miles. Asteroids can be classified in various ways, with one group comprising stony, iron, and stony-iron types. 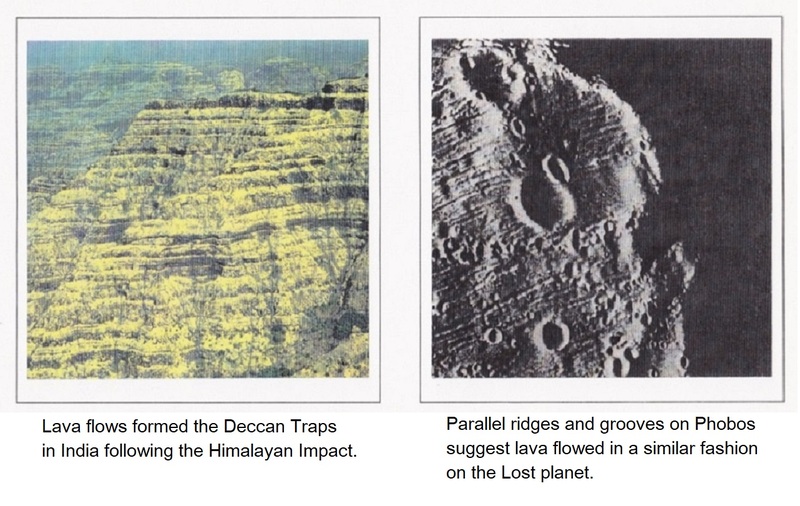 These are all fragments of the Lost Planet and have probably resided within the Main Asteroid Belt since the Precambrian-Cambrian boundary. A different group consists of carbonaceous chondrites, which contain water, organic compounds, and even micro-diamonds, and which may represent the burned out remains of nucleate comets. Stony-iron meteorites have been claimed to be 4.6 billion years of age. There is evidence, however, that the meteorites were exposed to cosmic radiation in space for a much shorter period. The frequency of fission tracks in the meteorites resulting from cosmic radiation is much lower than would be expected if the meteorites had been exposed in space for billions of years. The logical conclusion is that the meteorites were shielded from cosmic radiation within a large protective body. Every stony-iron meteorite tested has provided the same result and it is surmised that their period of exposure has been as short as around one-half billion years. The dating of fission tracks is not a precise technique and the destruction of the Lost Planet probably occurred at the Precambrian-Cambrian boundary, which is now thought to have been about 541 million years ago. The major catastrophe at this important contact might not have been restricted to Earth, but one that affected the entire Solar System. An influx of comets from the Oort Cloud would have been part of this indeterminate event. The comets provided Earth with additional sea water, and additional life (in the form of bacteria and viruses), plus hydrocarbons (which provided sustenance for the bacteria), and which brought about the so-called ‘biological big bang’ of the early Cambrian period. By contrast, a sister planet disintegrated. That might have been Earth! We are told that the reason sea water is salty is that salt (NaCl) is being leached out of the rocks. Sodium, and especially chlorine, however, are uncommon in rocks. The salt must have been already a constituent of the water when Earth received its oceans. The hemisphere north of the demarcation line presents a surface of smooth plains with relatively few craters, dotted with volcanos. Lava, it has been claimed, must have masked all evidence of the previous, heavily cratered terrain which existed there. At least some of the ‘lava’, however, even in one description provided by NASA, is not lava at all, but water-lain sediment as proven by a photo that includes a splosh crater occupying the floor of a larger crater. Two volcanic centers just north of the geographic equator are situated 90o of longitude apart, (Mars has been assigned 0o to 360o of longitude, unlike Earth which has 180o East and West.) One of the centers contains three small shield volcanos while the other contains four large shield volcanos and half a dozen small ones. Of the four large volcanos, the most impressive is Olympus Mons. Having a diameter up to 600 km (370 mi.) and standing some 27 km (17 mi.) above the surrounding plain, it is thought to be the largest in the entire Solar System. Olympus Mons has a sharply defined, complex vent which formed as lava subsided after eruptive episodes. Its shield is encircled by a continuous, slightly eroded escarpment providing a vertical drop of as much as 4 km (2.5 mi.) down to the surrounding plain. The escarpment probably formed as this massive volcano was attracted away from Mars gravitationally during a close encounter with another world. The surrounding area was attracted less strongly and fell away. The significant gravitational effect suggests the escarpment resulted from close contact with a more massive world. Mars is known to have had close encounters with Earth, which has almost 10 times the mass of Mars, and I suspect that Earth was that world. Again, I am using the term ‘world’ to describe a spherical planet or moon having an iron core surrounded by a stony mantle. I will speculate later about a common origin for every world, and you are already familiar with my claim that some planets and moons have changed roles. A significant feature associated with Olympus Mons is an extensive adjoining zone of collapsed terrain made up of curved ridges and troughs having their concave side facing the volcano. This area appears to have played an important role in the growth of Olympus Mons. 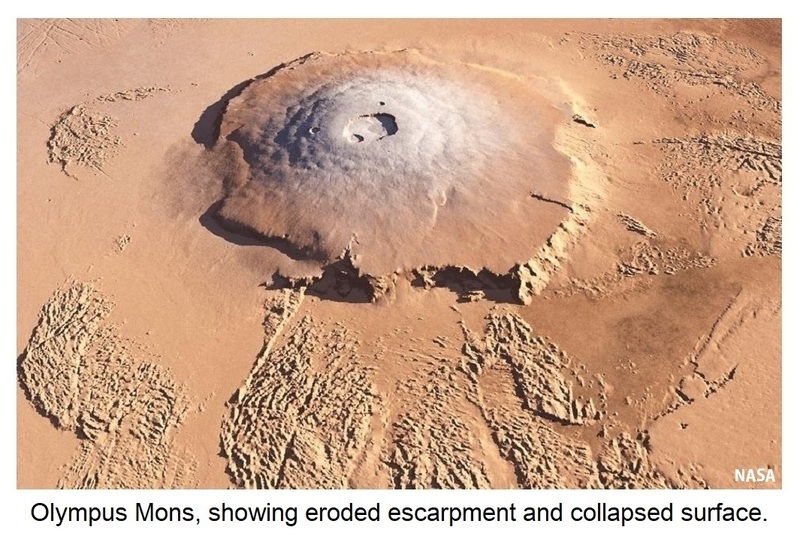 Three neighboring volcanos, considerably smaller than Olympus Mons but still larger than any mountain on Earth, are also partially encircled by faulted escarpments. Their peaks share a remarkably common elevation even though there is as much as 8 km (5 mi.) difference in the height of their bases, indicating gravitational rather than hydrostatic control. The North Polar Region is crowned by an ice cap displaying a prominent concentric, spiral pattern. 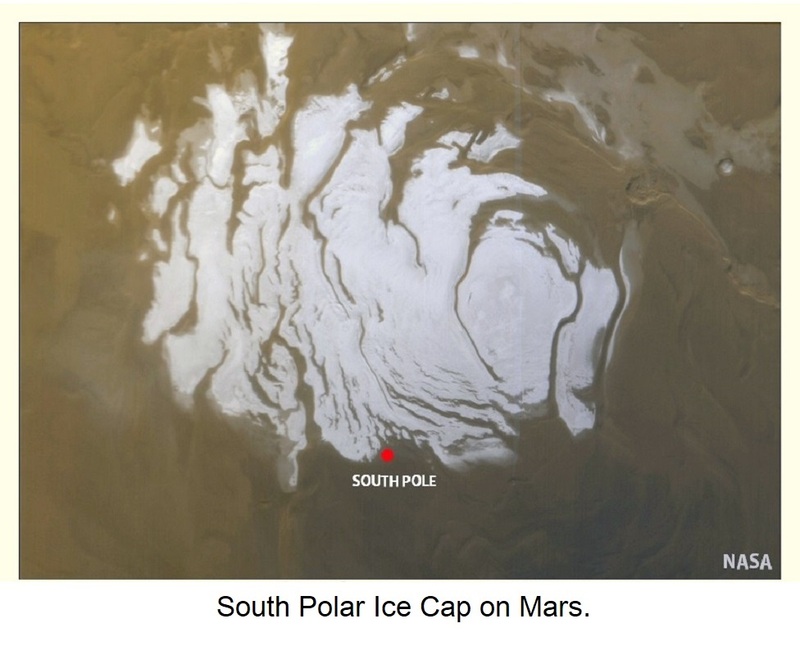 Much of this ice cap is permanent, consisting of water-ice. It grows larger each winter and smaller again each summer from the sublimation of carbon dioxide. (Sublimation describes a change of state either from solid to gas or gas to solid.) The dark pattern is due to a spiral arrangement of eroded, terraced canyons along which the underlying surface has been exposed. The spiral direction (observed from above) is counter-clockwise. The canyons are thought to be up to several kilometers wide and more than a kilometer deep. The ice cap is encircled by extensive fields of sand dunes. The hemisphere south of the demarcation line is densely cratered and rugged. 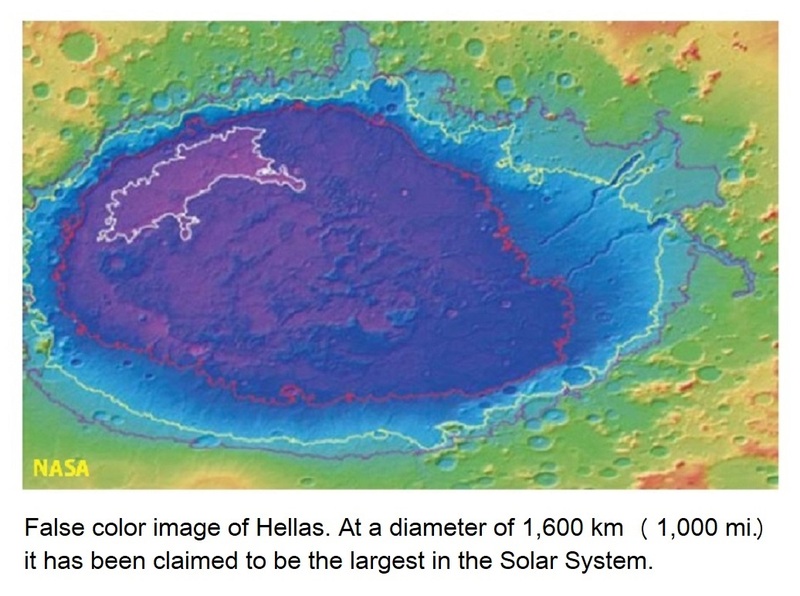 Craters vary in size up to the crater Hellas Planitia, with a diameter of some 1,600 km (1,000 mi. ), which is claimed by astronomers to be ‘the largest crater yet discovered in the Solar System’. They will have to drop that claim soon. There is a paucity of smaller craters, compared to the surface of Earth’s moon. There are no young volcanos south of the geographic equator but a crustal bulge on part of the equator is traversed by a most remarkable feature. Extending for some 4,000 km (2,500 mi), or more than one fifth of the planet’s circumference, is a complex of canyons so extensive and deep that Earth’s Grand Canyon seems practically insignificant by comparison, and would be scarcely noticed, except for its contrasting appearance, were it to be added as a hanging valley. The canyon ‘Coprates’ alone has a width of more than 150 km (93 mi) and a flat floor as much as 6 km (3.7 mi) lower than the surrounding surface. Its walls have failed extensively by slumping, and are incised by drainage lines along its entire length. 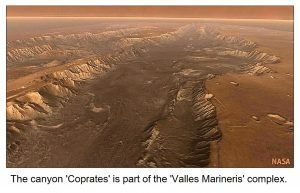 If you examine the image you may notice differences between NASA’s image of Valles Marineris and any similar canyon complex on Earth. The smooth upper elevation surface arrives at the canyon abruptly, with no transition to the canyon walls by water erosion. The main channel floor is remarkably flat from side to side. 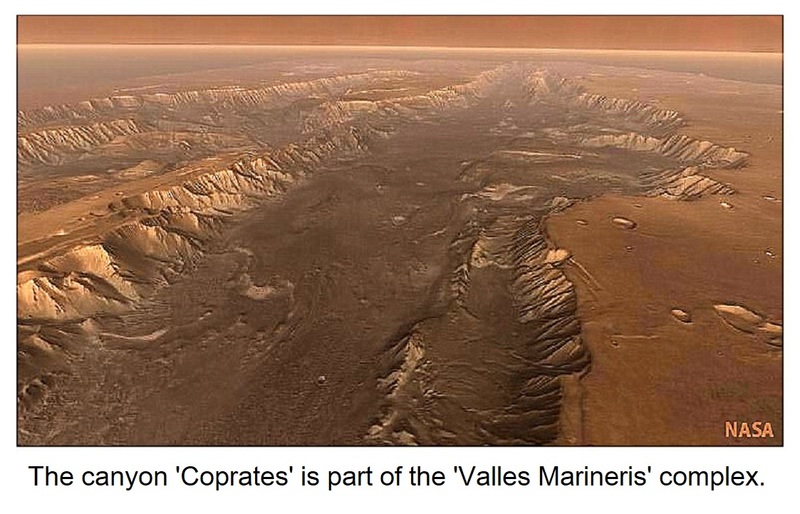 I believe these differences reflect the contrasting erosional processes that were involved, for Valles Marineris was literally routed out of the Martian surface rather than more slowly eroded by processes familiar to us on Earth. The South Polar Region has an ice cap as well, much smaller than its northern counterpart, but which displays a complex of similarly terraced canyons. These canyons have a less well defined spiral pattern, but one which trends in the opposite direction to those on the northern ice cap. Just as in the north, sublimated carbon dioxide causes the area of the ice cap to fluctuate with the seasons and it is also encircled by extensive sand dunes. Basalt on Earth forms by differentiation as mantle peridotite undergoes decompression while approaching the surface. It underlies every ocean on Earth as well as every continent. Earth’s continents are made up partly of granite for which peridotite, and hence basalt, provided original material. A flood of basalt poured onto the surface of India, just as a similar flood had covered much of Siberia, and later, the Columbia River Plateau. Lava floods constitute an anomaly within a plate tectonic system and it is probable that every extensive lava flood on Earth is a consequence of a major impact. Many stony meteorites consist of basalt, as do the surfaces of our Moon, Venus, and Mars, and it is likely that basalt is the most common crustal material of every rocky world in the Solar System. Basalt is made up of mineral groups known as plagioclase feldspars and ferromagnesian silicates, with occasional traces of quartz, but there is one thing that it does not have. Basalt contains no sand-sized grains of quartz. Quartz is a common sand-forming mineral that most commonly results from the weathering of granite, and quartz grains accumulate in great quantities on the continental shelves on Earth. When samples of sediment are collected from the Martian surface, the sand dunes should not be overlooked. Determining the composition of the sand dunes will reveal if that sand came from Earth. I presented a paper on this topic to the Planetary Geology Group at JPL, and it was not well received by one member of the audience who considered himself an expert on all things to do with Mars. After leaving JPL, I remarked that perhaps I should have kept going past Pasadena to Hollywood, because people who deal in fantasy may be more capable of recognizing reality. As a picture hanging on my wall of a polar bear in a snowstorm demonstrates, we recognize anything only by comparing it to something else. Writing in ‘Broca’s Brain’ (page 184), Carl Sagan compared two similar fields of sand dunes. One lies within Great Sand Dunes National Monument, near Alamosa, Colorado, where it has been deposited within a curve made by the Sangre de Cristo Mountains. The other is on Mars, in an area called Hellespontus, where it occupies an eroded remnant of a large impact crater. Since scientists attribute terrestrial sand deposits on Earth to wind, it should come as no surprise that they attribute similar deposits on Mars to wind as well. At this point, a problem should be recognized—which is that Mars has hardly any air. Its atmospheric pressure is less than 1% of that on Earth. The Martian winds can sculpt dunes where they are situated within a crater, such as Hellespontus, but they could not have deposited them there. Here is a demonstration of how specialization in science can lead us away from reality, and I quote Velikovsky from the final page of his epilogue in ‘Worlds in Collision’: Barriers between sciences serve to create the belief in a scientist in any particular field that other scientific fields are free from problems, and he trusts himself to borrow from them without questioning. It can be seen here that problems in one area carry over into other scientific areas, thought to have no contact with each other.” The dune field on Mars formed more than a million years ago, while the one in Colorado formed 10.5 thousand years ago, but they share a unique bond: They were both formed by the same sea. A current geology textbook (‘Physical Geology’ by Skinner and Porter) informs that a yardang is “an elongate and streamlined wind-eroded ridge.” So prevalent is the belief that wind is a major agent of erosion on Earth that it has been claimed to be responsible, not only for yardangs but, at least in part, for practically every type of landform in existence. An earlier textbook (‘Principles of Geomorphology’ by W.D. 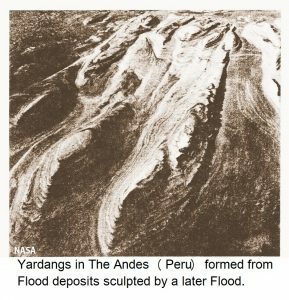 Thornbury) informs: “Possibly the only topographic form that can be attributed unequivocally to wind abrasion is the yardang.” The term, curiously, was first applied to depressions but is now applied only to ridges. It was always an obscure term in any case—until yardangs were discovered on Mars. Most scientists do not know that most of Earth’s land surface, including present high altitude areas, has been sculpted by water, due to axis change. Since they attribute yardangs to erosion by the wind on Earth, they naturally attribute them to the same process on Mars. When yardangs were discovered on Mars they were accepted by scientists as proof that wind is a dominant erosional and depositional agent there even though Mars has hardly any air. In 1976, Viking Lander 1 touched down on a gently rolling volcanic plain, 22o north of the Martian equator. Images that the spacecraft transmitted to Earth revealed a surface littered with broken rock and low dunes made up of finer grained sediments. One of the images showed something else. As the spacecraft braked to slow its descent, exhaust gases from its retro-rockets blasted away unconsolidated surface material to expose a firmer layer of what may prove to be calcrete. A similar bed of limestone forms a layer just below the surface of much of the Earth’s arid areas. Calcrete (also called duricrust, or caliche) forms as sea-water is drawn toward the surface by capillary action. As sea-water evaporates it leaves behind a precipitate of its mineral content, forming a layer of impure limestone. This layer could be widely distributed on Mars, for in one of the Viking Lander experiments, surface material effervesced strongly when brought into contact with hydrochloric acid. 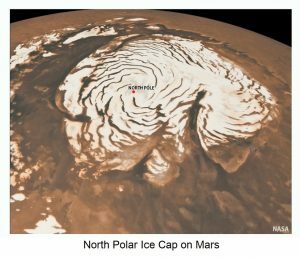 As soon as it became accepted that water had once flowed upon the surface of Mars, speculation began to develop about extensive reservoirs of ice that must have existed within the Martian crust. Heat from volcanic activity must have caused some of this ice to melt, releasing water which created the canyons and channels. Since stream patterns clearly indicate the water flowed from east to west, the source must have been an extensive area of chaotic terrain to the east of the canyons where many of the ‘outflow’ channels begin. Furthermore, splosh craters must have been formed by meteorites impacting icy ground ‘over billions of years’. As the scientists continued to interpret their own data it confirmed their knowledge about events which, it became increasingly clear to them, had all taken place ‘billions of years ago’. They confirmed the age of the surface by the number of craters that had formed on it over all of that time, and they noted that the floors of the largest craters are level and smooth, further confirming their great age. It was fascinating to read that the source of the Martian flood has been identified as “springs and precipitation”, for in the Book of Genesis, Chapter 7, Verse 11, it is written: “…the same day were all the fountains of the great deep broken up, and the windows of heaven were opened.” It appears that the priests of science are prepared to employ the explanations of the priests of religion when called upon to explain a situation they haven’t yet quite grasped. They cannot yet bring themselves to accept that the water came from Earth, but when fossils from Earth are found there, everyone will know. Bulges upon Earth’s surface, which are as much as 10 km (6.2 mi.) high and several thousand kilometers across could be the result of past planetary encounters. On Mars, a positive gravitational anomaly coincides with the highest part of the Tharsis bulge, indicating that the bulge is supported by denser material from beneath the crust. This is the only indication of deep magma that has been recognized, for all Martian volcanos appear to have a shallow source. Although an (undefined) relationship has often been claimed between the Tharsis bulge and Valles Marineris this is unlikely, since the ‘Space Router’ cut across all topography that it encountered (See : #13: The Martian Flood). None of the small bulges on Mars display strong gravitational anomalies, suggesting that they are isolated from sources of deep magma. The thick, immobile crust of Mars is evidence of a low internal energy level in the planet’s interior, while by comparison, numerous large asteroid impacts on Earth have resulted in a high level of internal energy. Olympus Mons and the other shield volcanos of the Tharsis and Elysium regions on Mars present a geologically young appearance and may have developed rapidly at times of close encounters with other worlds. During every close encounter, the rocky surface bulged and the constraining pressure upon underlying rocks was reduced. The following explains processes that could have controlled the development of the great shield volcano, Olympus Mons. Ice under pressure at the base of a glacier can melt because liquid water occupies less volume than an equal mass of ice, assisting glaciers to move. In contrast, liquid rock occupies a greater volume than an equal mass of solid rock. Rock that is sufficiently deep can remain solid even when its temperature reaches that of lava at the surface because it is being constrained by the weight of overlying rock and so is unable to expand. Reducing the weight of overlying rock can cause a buried rock to liquefy, which can happen when another world draws close. A bulge, in the form of a low, standing wave of solid rock moved across the Martian surface as Mars rotated beneath it, and lava was squeezed upward from the liquefied layer. Lava which normally weighs 38% of what it would weigh on Earth now weighed much less, so the usual limitations on the elevation to which it could be pumped no longer applied. Prolific outpourings of lava led to the development of Olympus Mons and others which dwarf the highest mountains on Earth. Scientists base their calculations of the ages of Martian volcanos upon observed rates of hotspot volcanism on Earth, but they are incomparable. 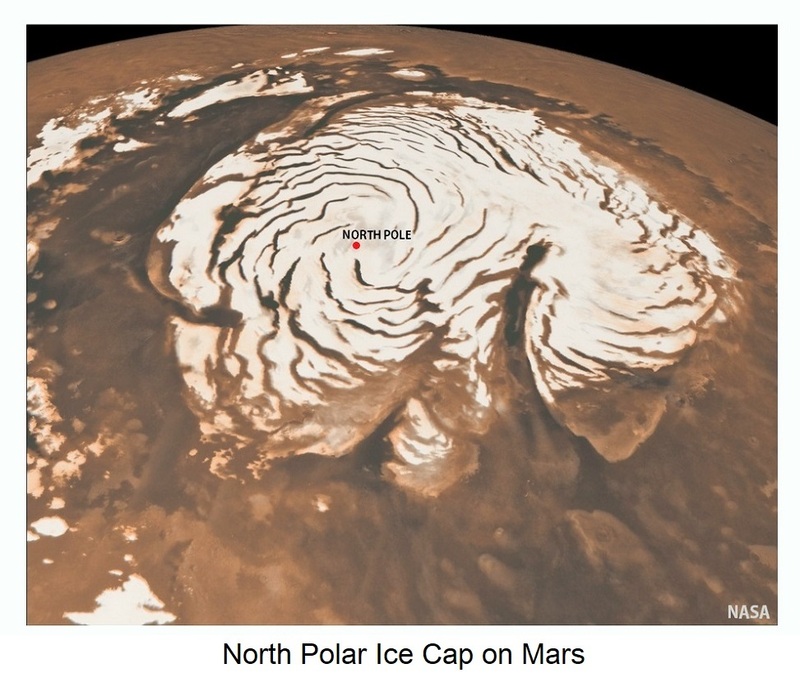 Characteristics of the Martian crust cannot be inferred from the hydrostatic head required for magma to be pumped to the top of Olympus Mons without allowing for the decreased force of gravity when another world is near. The source of the lava forming Olympus Mons appears to be a region of collapsed terrain that covers an area several times that of the volcano. The strongly textured area was faulted repeatedly into curved ridges and troughs as slumping proceeded. Lava was contributed from within a zone below the surface in which the temperature of the rock was high enough for it to melt when the weight of overlying rock was reduced. 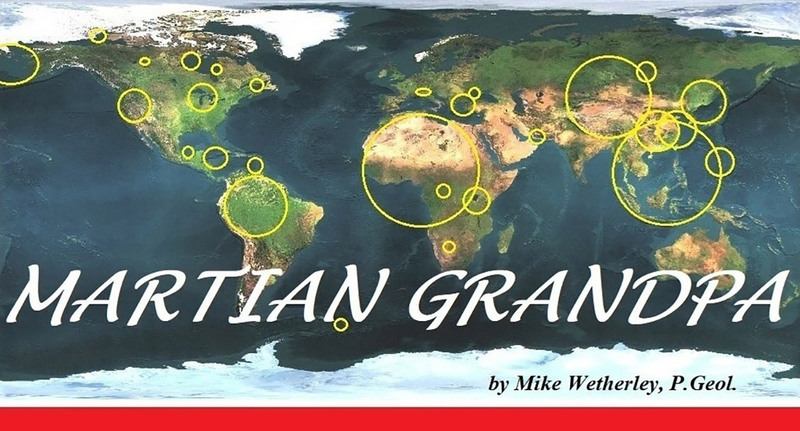 As the mass of the volcano developed, the gravitational attraction of a nearby world caused the crust to fracture. A continuous fault scarp formed around the shield and the surrounding plain dropped away. The resulting cliff has a height of up to 4 km (2.5 mi. ), which is nearly one half the height of Mt. Everest from sea level. Some observers have concluded, from the enormous size of Olympus Mons, that the source of the lava was situated deep beneath the surface. Instead, the region of collapsed ground adjacent to the volcano indicates the source was quite shallow. When another world draws close to us, volcanism on Earth increases as well. There are other effects on Earth. The sudden release of long-term stress accumulated within a plate-tectonic system can result from a close encounter. Mountain ranges grow rapidly higher at such times, and other large-scale geological structures undergo change. When Venus made its first close approach to Earth in about 1522 B.C. sea levels dropped suddenly about 6 m (20 ft.). This resulted in ‘raised’ coastal platforms around the world. Tectonic forces that had built up over thousands of years were released, and the geometry of the ocean basins was changed. If you should holiday in the tropics, look for these platforms. Many were formed from reefs since some corals tend to be at sea level at low tide, and you might find a surface displaying dead coral, perhaps with shells. Some presently inhabited islands in the Pacific would have been under water before this drop in sea level occurred. Tektites are glassy meteorites having a length of up to several centimeters, found across Earth’s surface in what geologists term ‘strewn fields’. Tektites come from Mars at times of close encounters with Earth, and there is a dated record of the most recent event. The arrival of tektites dates only to Tertiary age because older glass has crystallized and disintegrated. Tektites are typically more than two-thirds silica, having a composition that is similar to that of granite. If their source rock was basalt, the high silica content required some process of differentiation by which minerals with lower silica content were concentrated out of a basaltic magma. Such a process typically takes place either by crystals settling out of solution or by growing on the cooler surfaces of a magma chamber. Siliceous rocks crystallize at lower temperatures than more basic rocks. Under the gravitational influence of Earth, Martian rocks bulged toward the surface, and the reduced confining pressure caused a layer within the crust to liquefy. Molten rock surged toward the volcanic vent and a rush of magma blasted away a vent plug developed during a preceding episode of volcanism, and which was ejected toward Earth to form tektites. Siliceous magma is more viscous than basaltic magma. Contained gases are less able to escape and so siliceous lava tends to be explosive. The volcanic fragments were reheated by their travel through Earth’s atmosphere until they exploded from the pressure of expanding gases. The altitude at which this occurs varies considerably. More streamlined ones may derive from fragments that explode at higher altitudes, with irregularly shaped ones coming from fragments that explode closer to the ground. During my mineral exploration days, I met a station (ranch) manager in Western Australia who told me about a neighbor with a tektite trap. I first took this to be the sort of story that is told to a supposedly naïve young Canadian geologist, but it turned out that the neighbor really did have a tektite trap and one which had been quite productive. On his property, there was a shallow surface layer of red laterite overlying a gently sloping hardpan base, and the enterprising manager had installed several strands of clothesline across the slope so that tektites washed out of the surface layer would get caught up on them. After an (infrequent) heavy rain he would go out with a pail and pick up tektites to sell to tourists. 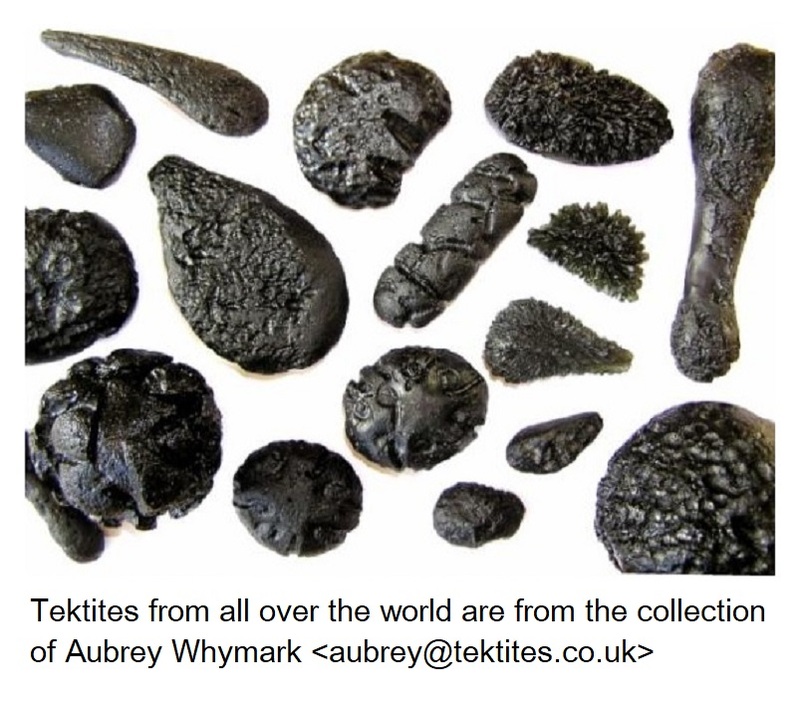 Tektites that are known as ‘australites’ are readily found in Western Australia and South East Asia, having arrived in the 7th century B.C. This would explain their remarkably fresh appearance and close proximity to the surface, as well as the pristine appearance of the caldera vent on Olympus Mons which is proposed as their source. It should be noted, however, that the vents of some other Martian volcanos have a similar fresh appearance. Documented sources (‘Worlds in Collision’) recount that on the night of March 23, 687 BC: “In the night, stars fell like rain.” That was the night of the annihilation of King Sennacherib’s army (Isaiah 37:36) as Mars passed overhead. Thousands of meteorites collected on Earth have been analyzed and it has been concluded that almost all of them have come from asteroids. Some, however, were thought to have come from Mars, if only some way could be found to account for this. The letters in the unusual term ‘SNC’ stand for Shergotty in India, Nakhla in Egypt and Chassigny in France, three places where the first meteorites of this type were found. They are thought to be younger than most other meteorites, while their composition and texture show they formed on a body with a strong gravitational field. Analyses of the gasses from glassy inclusions within these meteorites show the relative abundance of some gaseous elements is similar to their occurrence in the Martian atmosphere. Scientists have been challenged to invent a scenario that could account for this compelling evidence without requiring them to recant their dogma. The major stumbling block has been that SNC meteorites do not exhibit the shock deformation effects they expect from the application of a force able to overcome the normal 34.1 km (21.2 mi.) per second escape velocity on Mars. Escape velocities are much lower, however, during close encounters between worlds. Explosive volcanism at such times even results in the direct transfer of volcanic ejecta from Mars to Earth. It has been just over 2,700 years since Mars retreated to its present orbit. Astronomers wonder how former asteroids ended up as moons of Mars for it is unimaginable to them that Mars travels to the Main Asteroid Belt, acquires fragments of the Lost Planet as moons, and brings them close to Earth. It is a wonder of wonders that this catastrophic system is the driver of evolution on Earth resulting, for one thing, in a species that is able to contemplate its own origins.